Keep your guests entertained with Mini Golf and Golf Themed Games and Activities ! We bring the golf, do all the set up and then run the Par-Tee! The Mini Golf Par-Tee is a fun and unique party theme. It appeals to kids and adults alike. Our Birthday Mini Golf is fun and unique. It appeals to kids and adults alike. We bring our portable mini golf to your location, set it up, run the course and organize themed activities and events according to the age and number of guests you have participating for the party. Great for all ages, kids thru adult! 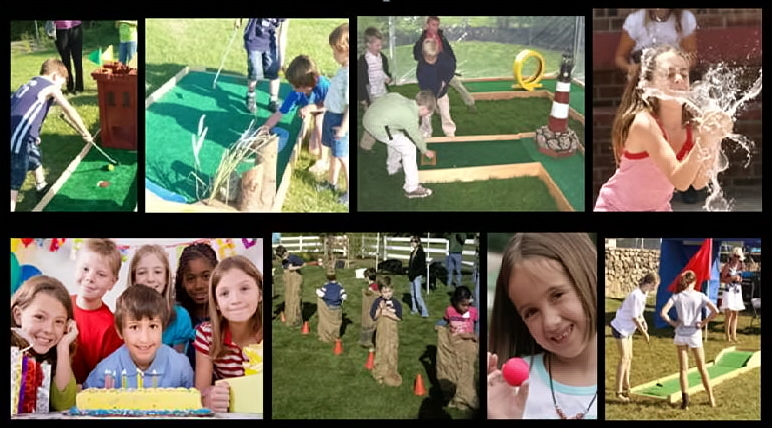 We offer several Mini Golf Par-Tee packages that offer a variety of activities to suit individual party needs and budgets. You choose what works best for your party, we take care of the rest! Mini Golf Par-Tee: 9 Holes of Mini Golf, Candy Golf Game to make Goody Bags for all guests, Golf Party Bag Decorating, and golf themed group activities and an Event Host to run the party. Selected activities are based on number of guests and their ages. Mini Golf Fun: 9 Holes of Golf, Tattoos and an Event Host to run your party for you. Mini Golf Rental: On a limited basis, we offer Mini Golf as a party rental. Includes all set up and break down. 9 or 18 Holes of mini golf with putters and balls. Note: This is typically NOT the cheapest way to have golf at your event, but usually the best option if you need mini golf for a duration of more than 3 hours for your event. Click here to contact us for availability and pricing!